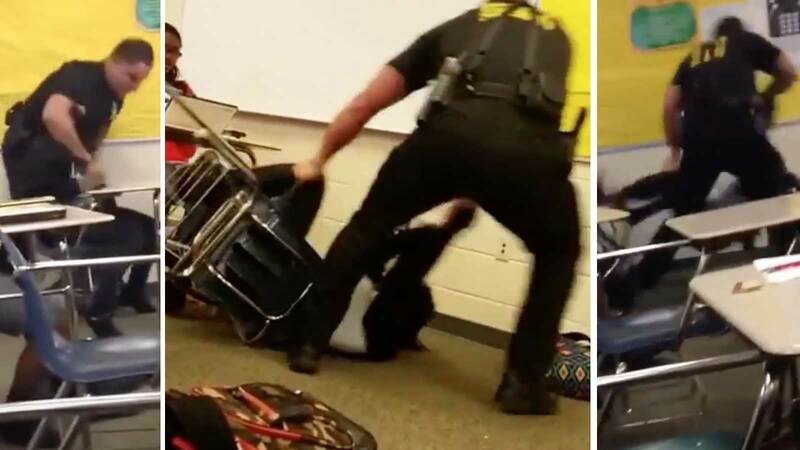 Ben Fields, the South Carolina sheriff’s deputy who was video-recorded beating up a black schoolgirl who was sitting peacefully at her desk, has been fired. Fields was fired from the Richland County Sheriff's Department after an internal investigation and is being investigated by the FBI and DoJ for civil rights violation. Many parents at Spring Valley High School expressed relief that Fields was out of a job, but were frustrated that it took so long for him to get the boot. They pointed out that administering vicious beatings to passive schoolchildren is not in any school cop's job description and was evidence of his gross unfitness for the job. Students (especially racialized students) who swear or shout at teachers are often expelled and even pipelined into the criminal justice system without any appeal or investigation. Other parents said they were sad to see him go and insisted that the spectacle of a white cop beating up a black child in South Carolina was not racial, and couldn't be, since Fields reportedly has a black girlfriend. Richland County Sheriff Leon Lott agreed. The school board released a statement about the incident, with chairman James Manning saying he found the video “extremely disturbing”. “The amount of force used on a female student by a male officer appears to me to be excessive and unnecessary,” Manning said. He said that the county superintendent, Debbie Hamm, had contacted the sheriff to make sure the deputy was banned from all district schools. Lott told reporters he “wanted to throw up” after watching the video, but added that he doubted any racial element to the incident, in part because Fields has dated an African American woman for “quite some time”.